1. Department of Clinical Pathological Biochemistry, Faculty of Pharmaceutical Science, Doshisha Women's College of Liberal Arts, 97-1 Kodo Kyo-tanabe, Kyoto 610-0395, Japan. 2. Division of Cellular Biosignal Sciences, Department of Biochemistry, Iwate Medical University, 2-1-1 Nishitokuta, Yahaba-cho, Shiwa-gun, Iwate 028-3694, Japan. 3. Kinki University Faculty of Medicine 377-2 Ohnohigashi, Osaka-sayama 589-8511, Japan. Chronic inflammatory diseases, such as rheumatoid arthritis and periodontitis-caused bone destruction, results from an increase of bone-resorbing osteoclasts (OCs) induced by inflammation. However, the detailed mechanisms underlying this disorder remain unclear. We herein investigated that the effect of urokinase-type plasminogen activator (uPA) on inflammatory osteoclastogenesis induced by lipopolysaccharide (LPS), which is a potent stimulator of bone resorption in inflammatory diseases. We found that the uPA deficiency promoted inflammatory osteoclastogenesis and bone loss induced by LPS. We also showed that LPS induced the expression of uPA, and the uPA treatment attenuated the LPS-induced inflammatory osteoclastogenesis of RAW264.7 mouse monocyte/macrophage lineage cells. Additionally, we showed that the uPA-attenuated inflammatory osteoclastgenesis is associated with the activation of plasmin/protease-activated receptor (PAR)-1 axis by uPA. Moreover, we examined the mechanism underlying the effect of uPA on inflammatory osteoclastogenesis, and found that uPA/plasmin/PAR-1 activated the adenosine monophosphate-activated protein kinase (AMPK) pathway through Ca2+/calmodulin dependent protein kinase kinase (CaMKK) activation, and attenuated inflammatory osteoclastogenesis by inactivation of NF-κB in RAW264.7 cells. These data suggest that uPA attenuated inflammatory osteoclastogenesis through the plasmin/PAR-1/Ca2+/CaMKK/AMPK axis. Our findings may provide a novel therapeutic approach to bone loss caused by inflammatory diseases. Chronic inflammatory diseases, such as rheumatoid arthritis and periodontitis frequently cause the bone destruction. Soluble factors including lipopolysaccharide (LPS) and pro-inflammatory cytokines such as tumor necrosis factor (TNF)-α and interleukin (IL)-1 regulate the progression of bone loss by resulting in the differentiation and activation of bone-resorbing osteoclasts (OCs) (1-3). Additionally, OC function is regulated by the receptor activator of NF-κB (RANK) and its ligand (RANKL), and the NF-κB signaling activated by RANKL has proven to be absolutely required for OCs development (4, 5). The NF-κB signaling is also activated by LPS, TNF-α, and IL-1 (6-8) and the specific inhibition of NF-κB markedly blocked inflammatory bone destruction (9). However, the mechanism of inflammation-induced bone loss remains poorly understood. It has been known that urokinase-type plasminogen activator (uPA) is associated with the inflammatory diseases such as rheumatoid arthritis, periodontitis, cancer, and fibrosis, and modulates the development of protective immunity (10-13). uPA is a serine protease that activates plasminogen (Plg) into plasmin, and is considered to be one of the mediators of fibrinolysis (14). uPA-generated plasmin not only degrade fibrin and any extracellular matrix (ECM) proteins but also activate matrix metalloproteinases, growth factors and protease-activated receptor (PAR)-1 (15, 16). Recently, it has been reported that PAR-1 can activate adenosine monophosphate-activated protein kinase (AMPK) through Ca2+/calmodulin dependent protein kinase kinase (CaMKK) (17), and the AMPK acts as a negative regulator during OC differentiation (18). However, the role of uPA, plasmin, PAR-1, and AMPK on inflammatory osteoclastogenesis remain poorly understood. We herein first report that uPA attenuated LPS-induced inflammatory osteoclastogenesis through the plasmin/PAR-1/Ca2+/CaMKK/AMPK axis. The animal experiments in this study were approved by the Animal Research Committee of Doshisha Women's College of Liberal Arts (Approval ID: Y13-018, Y14-020). The uPA deficient (uPA-/-) mice were kindly provided by Prof. D Collen (University of Leuven, Belgium). Wild type, uPA-/-mice littermates were housed in groups of two to five in filter-top cages with a fixed 12 hours light, 12 hours dark cycle. 25 mg/kg LPS was administered subcutaneously into the shaved back of the male mice. The administration was carried out weekly for up to 4 weeks. Bone histomorphometry of femurs in male uPA+/+ and uPA-/- mice were performed. Each femur was removed and fixed in 4% paraformaldehyde for 2 days, and then demineralized with 10% EDTA for 14 days before embedding in paraffin. Paraffin-embedded tissue was serially sectioned at 4-7-μm distances. Then, the sections were stained with TRAP by using TRAP kit (Sigma- Aldrich, MO, USA). For the quantitative evaluation of the intensity of TRAP-staining in decalcified sections of femurs from the uPA+/+ and uPA-/- mice, the TRAP-stained images obtained from separate fields on the specimens were analyzed by using ImageJ 1.43u. Bone mineral density (BMD) was measured as previously described (19). The BMD of femurs from mice at the indicated time was evaluated by using peripheral quantitative computed tomography with a fixed x-ray fan beam of 50-μm spot size, at 1 mA and 50 kVp (LaTheta LCT-100S; Aloka, Tokyo, Japan). Bone marrow cells were obtained as previously described (19). Bone marrow cells, RAW264.7 mouse monocyte/macrophage lineage cells were maintained in α-MEM supplemented with 10% fetal bovine serum (FBS) and 1% penicillin-streptomycin at 37℃ in a humidified atmosphere of 5 % CO2 / 95 % air. Mouse bone marrow cells or RAW264.7 cells were cultured for 3 days with LPS (1 μg/ml) and M-CSF (100 ng/ml) in 48-well plates. Cells were then fixed and stained for tartrate-resistant acid phosphatase (TRAP; a marker enzyme of OCs) as described (19). TRAP-positive multinucleated cells containing three or more nuclei were counted as OCs, under microscopic examination. Total RNA was extracted as previously described (19). First-strand cDNA was synthesized from total RNA by using the High Fidelity RT-PCR Kit (TOYOBO, Osaka, Japan). Quantitative RT-PCR (qRT-PCR) was performed on the IQ5 real-time PCR detection system (Bio-Rad, CA, USA) with SYBR Green technology on cDNA generated from the reverse transcription of purified RNA. The 2 step PCR reactions were performed as 92℃ for 1 sec and 60℃ for 10 sec. Plg, and uPA mRNA expression were normalized against GAPDH mRNA expression using the comparative cycle threshold method. We used the following primer sequence: Plg, 5'-TGGCTACATAAGCACACAAG-3' and 5'-ACATTCTGACAGATACACTC-3'; uPA, 5'-CGCCTGCTGTCCTTCAGAAAC-3' and 5'-CAA GATGAGCTGCTCCACCTC-3'; GAPDH, 5'-TGTGTCCGTCGTGGATCTGA-3' and 5'-TTGCTGTTGAAGTCGCAGGAG -3'. We studied a Western blot analysis as previously described (20). We detected NFATc1, phospho-AMPK, AMPK, IκBα, or GAPDH by incubation with anti-NFATc1 antibody, anti-phospho-AMPK antibody, anti-AMPK antibody, anti-IκBα antibody, or anti-GAPDH antibody followed incubation with horseradish peroxidase-conjugated antibody to rabbit IgG (Amersham Pharmacia Biotech, Uppsala, Sweden). pGL4.32 (luc2P/NF-κB/Hygro) vector contains five copies of NF-κB response element (NF-κB-RE) that derives transcription of the luciferase reporter gene luc2P (Promega, WI, USA). RAW264.7 cells were co-transfected with pGL4.32 (luc2P/NF-κB/Hygro) vector and the internal control vector pGL4.74 (hRluc/TK) using the Lipofectamine 2000 transfection reagent (Invitrogen, CA, USA) according to the manufacturer's protocol. At 24 hours post-transfection, the cells were stimulated with described reagents, and then assayed for luciferase activity using the Dual-Glo luciferase assay system (Promega, WI, USA) according to the manufacturer's protocol. All data are expressed as mean±SEM. The significance of the effect of each treatment (P <0.05) was determined by analysis of variance (ANOVA) followed by the least significant difference test. To clarify the role of the uPA in inflammatory osteoclastogenesis and bone destruction, we examined the bone mineral density (BMD) in the femurs of uPA deficient mice following the administration of LPS, which not only induces inflammation but also osteoclastic bone resorption (6). The LPS-induced decrease of BMD in the femurs of uPA-/- mice was significantly more potent than in uPA+/+ mice (Fig. 1A). Next, we examined the amount of OCs in the femurs of mice stimulated with LPS using TRAP-staining. The TRAP-positive area in the femurs of uPA-/- mice was significantly larger than that of uPA+/+ mice (Fig. 1B, C). Moreover, we examined the pre-OCs population in bone marrow-derived cells from mice following stimulation with LPS and macrophage colony-stimulating factor (M-CSF). The TRAP-positive cell number in the bone marrow-derived cells from uPA-/- mice was significantly higher than in uPA+/+ mice (Fig. 1D, E). Additionally, uPA treatment on the bone marrow-derived cells from uPA-/- mice attenuated the increase of TRAP-positive cell number induced by LPS (Fig. 1F, G). We examined the uPA and Plg mRNA expression levels in pre-OCs RAW264.7 cells stimulated by LPS (1 μg/ml). LPS induced both uPA and Plg expression, the maximum effect of LPS was observed at 2 days after stimulation (Fig. 2A). Furthermore, we examined the mechanism of LPS-induced uPA expression by using the mitogen-activated protein kinase (MEK) specific inhibitor (PD98059) and c-Jun N-terminal kinase (JNK) specific inhibitor (SP600125). 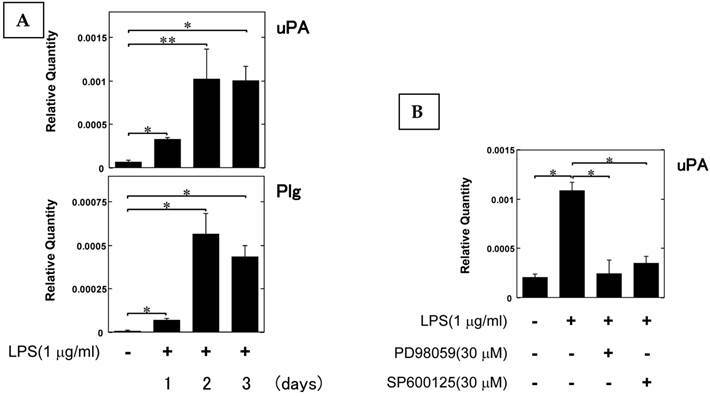 Both PD98059 and SP600125 attenuated LPS-induced uPA expression (Fig. 2B). This data suggest that the LPS-induced uPA expression is associated with the MEK and JNK pathways. We examined the effect of uPA on inflammatory osteoclastogenesis induced by LPS stimulation. uPA attenuated the increase of TRAP-positive cells (Fig. S1A and B) and nuclear factor of activated T-cells, cytoplasmic, calcineurin-dependent 1(NFATc1) (a hallmark of the osteoclast phenotype) expression (Fig. S1C) induced by LPS in RAW264.7 cells. We also confirmed that uPA attenuated the increase of TRAP-positive cells induced by LPS and M-CSF in bone marrow-derived cells from mice (Fig. S1D). Next, we examined the possible involvement of plasmin in the uPA-attenuated inflammatory osteoclastogenesis stimulated with LPS by using the plasmin specific inhibitor α2-antiplasmin (α2AP). α2AP abrogated the uPA-attenuated increase of TRAP-positive cells and NFATc1 expression induced by LPS in RAW264.7 cells (Fig. S1E-G). Additionally, plasmin attenuated the LPS-induced increase of TRAP-positive cells (Fig. S1E and F) and NFATc1 expression (Fig. S1G) in RAW264.7 cells. We also confirmed that α2AP abrogated the uPA-attenuated increase of TRAP-positive cells, and that plasmin attenuated the LPS-induced increase of TRAP-positive cells, in bone marrow-derived cells from mice (Fig. S1H). 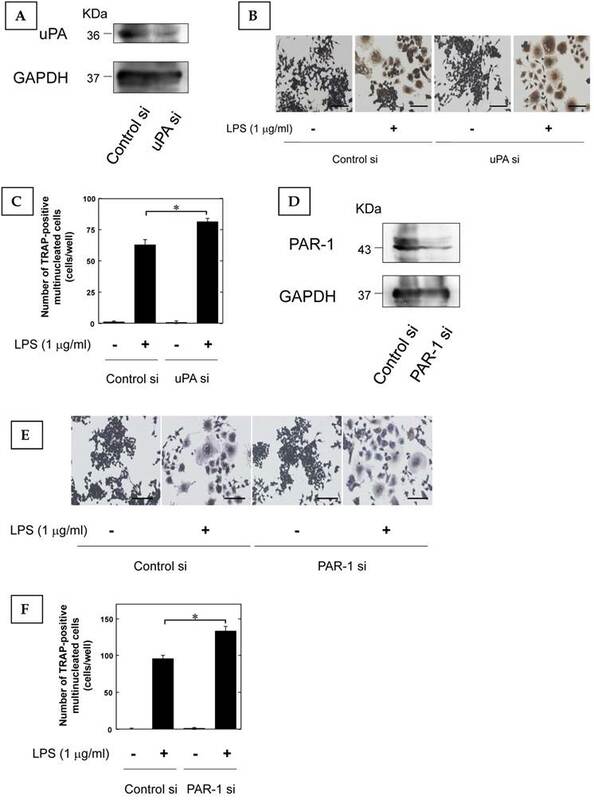 Because it has been reported that plasmin can activate PAR-1 (21), we examined the possible effect of PAR-1 on the uPA-attenuated inflammatory osteoclastogenesis induced by LPS. The PAR-1 specific antagonist SCH 79797 (22) significantly and partially abrogated the uPA-attenuated increase of TRAP positive cells (Fig. S1I and J) and NFATc1 expression (Fig. S1K) induced by LPS in RAW264.7 cells. We also confirmed that SCH 79797 abrogated the uPA-attenuated increase of TRAP positive cells in bone marrow-derived cells from mice (Fig. S1L). We also confirmed that the PAR-1 agonist TFLLRN-NH2 (23) significantly and partially attenuated the increase of TRAP-positive cells (Fig. S1M and N) and NFATc1 expression (Fig. S1O) induced by LPS in RAW264.7 cells. We also confirmed that TFLLRN-NH2 attenuated the LPS-induced increase of TRAP-positive cells in bone marrow-derived cells from mice (Fig. S1P). The uPA deficiency promotes inflammatory osteoclastogenesis and bone destruction. 25 mg/kg LPS was administered subcutaneously into the shaved back of the male mice. The administration was carried out weekly for up to 4 weeks. (A) The BMD in the femurs of the LPS-administered male uPA+/+ and uPA-/- mice was obtained from pQCT measurement (saline or LPS-administered uPA+/+ mice, n=9; saline or LPS-administered uPA-/- mice, n=8). (B) The TRAP-staining of femurs in the LPS-administered male uPA+/+ and uPA-/- mice. (C) The intensity of TRAP-staining on the decalcified sections in the LPS-administered male uPA+/+ and uPA-/- mice was quantitatively evaluated as described in the Materials and Methods (n=6). (D) Bone marrow-derived cells from the uPA+/+ and uPA-/- mice were cultured for 3 days in the presence of LPS (1 μg/ml) and M-CSF (100 ng/ml). Then, TRAP-staining was performed to detect mature OCs. (E) Mature OCs were identified as multinucleated TRAP-positive cells (n=4). (F) Bone marrow-derived cells from the uPA-/- mice were cultured for 3 days with LPS (1 μg/ml), M-CSF (100 ng/ml), and with or without uPA (10 nM). Then, TRAP-staining was performed to detect mature OCs. (G) Mature OCs in the uPA-/- mice were identified as multinucleated TRAP-positive cells (n=3). The data represent the mean ± SEM. *, P<0.01; **, P<0.05; NS, not significant. Scale bar = 200 μm. LPS induced uPA and Plg mRNA expression in pre-OCs RAW264.7 cells. (A) RAW264.7 cells were stimulated with 1 μg/ml LPS for the indicated periods. The uPA, and Plg mRNA expression in RAW264.7 cells stimulated by LPS was evaluated by qRT-PCR (n=3). (B) RAW264.7 cells were pretreated with PD98059 (30 μM) or SB203580 (30 μM) for 30 minutes and then stimulated with LPS (1 μg/ml) for 48 hours. The uPA mRNA expression in RAW264.7 cells stimulated by LPS was evaluated by qRT-PCR (n=3). The data represent the mean ± SEM. *, P<0.01; **, P<0.05. Furthermore, we examined that the effect of LPS-induced osteoclast differentiation on the reduction of uPA and PAR-1 expression by using siRNA. We confirmed that uPA and PAR-1 expression in RAW264.7 cells was attenuated by siRNA (Fig. 3A, and D, respectively). The reduction of uPA and PAR-1 expression promoted the LPS-induced increase of TRAP-positive cells in RAW264.7 cells (Fig. 3B and C, Fig. 3E and F, respectively). Adenosine monophosphate-activated protein kinase (AMPK) acts as a negative regulator during OC differentiation (18). An AMPK activator, 5-aminoimidazole-4-carboxamide 1-β-D-ribofuranoside (AICAR) (24), attenuated the increase of TRAP-positive cells (Fig. S2A and B) and NFATc1 expression (Fig. S2C) induced by LPS in RAW264.7 cells. We also confirmed that AICAR attenuated the LPS-induced increase of TRAP-positive cells in bone marrow-derived cells from mice (Fig. S2D). Next, we examined whether AMPK activation is associated with uPA-mediated inflammatory osteoclastogenesis. First, we observed that uPA induced the phosphorylation of AMPK at 60 minutes after the uPA stimulation (Fig. S2E). Additionally, we confirmed that the AMPK inhibitor compound C (25) partially suppressed the uPA-attenuated increase of TRAP-positive cells (Fig. S2F and G) and NFATc1 expression (Fig. S2H) induced by LPS in RAW264.7 cells. We also confirmed that compound C also suppressed the uPA-attenuated increase of TRAP-positive cells in bone marrow-derived cells from mice (Fig. S2I). We also examined the effect of plasmin on the uPA-activated AMPK pathway; the plasmin inhibitor α2AP attenuated the uPA-induced phosphorylation of AMPK (Fig. S2J), and plasmin and a PAR-1 agonist TFLLRN-NH2 induced AMPK phosphorylation (Fig. S2K, and L). Moreover, the PAR-1 antagonist SCH 79797 suppressed the uPA-induced AMPK phosphorylation (Fig. S2M). It has been reported that AMPK attenuates the NF-κB pathway which plays a pivotal role in the induction of osteoclastogenesis associated with inflammation (26-28). Therefore, we examined the effect of uPA, plasmin, PAR-1, and AMPK on the LPS-induced NF-κB transcriptional activity through the use of a functional promoter assay with NF-κB-responsive element as described in Materials and Methods. 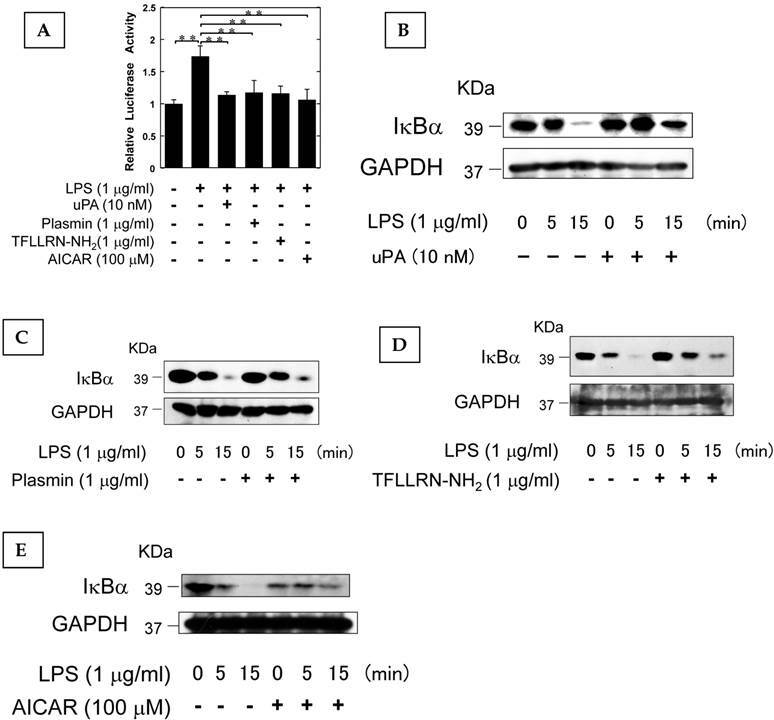 uPA, plasmin, TFLLRN-NH2, and AICAR attenuated the LPS-induced NF-κB activation (Fig. 4A). We also confirmed that uPA, plasmin, TFLLRN-NH2, and AICAR attenuated the LPS-induced IκBα degradation (Fig. 4B, C, D, and E, respectively). These data suggest that uPA, plasmin, TFLLRN-NH2, and AICAR attenuated the LPS-activated NF-κB signaling. The reduction of uPA and PAR-1 promoted inflammatory osteoclastogenesis. (A) The transfection of RAW264.7 cells with control or uPA siRNA confirms the specific depletion of uPA by Western blot analysis. (B) RAW264.7 cells tranfected with control or uPA siRNA were cultured for 3 days in the absence or presence of LPS (1 μg/ml). Then, TRAP-staining was performed to detect mature OCs. (C) Mature OCs were identified as multinucleated TRAP-positive cells (n=4). (D) The transfection of RAW264.7 cells with control or uPA siRNA confirms the specific depletion of PAR-1 by Western blot analysis. (E) RAW264.7 cells tranfected with control or PAR-1 siRNA were cultured for 3 days in the absence or presence of LPS (1 μg/ml). Then, TRAP-staining was performed to detect mature OCs. (F) Mature OCs were identified as multinucleated TRAP-positive cells (n=4). The data represent the mean ± SEM. *, P<0.01. Scale bar = 200 μm. The AMPK pathway activated by uPA attenuated LPS-induced NF-κB activation. (A) RAW264.7 cells were co-transfected with a Fluc reporter plasmind containing NF-κB promoter and the internal control vector pRL-TK. At 24 hours after the transfections, these cells were cultured in the presence or absence of 10 nM uPA, 1 μg/ml plasmin, 1 μg/ml PAR-1 agonist TFLLRN-NH2, or 100 μM AICAR for 30 minutes, and then stimulated with 1 μg/ml LPS for 3 hours. Finally, the status of transcriptional activity of the promoter with NF-κB-responsive element was examined (n=3) as described in Materials and Methods. (B) RAW264.7 cells were pretreated with 10 nM uPA for 30 minutes and then stimulated with 1 μg/ml LPS for the indicated periods. Degradation of IκBα was evaluated by a Western blot analysis. (C) RAW264.7 cells were pretreated with 1 μg/ml plasmin for 30 minutes and then stimulated with 1 μg/ml LPS for the indicated periods. Degradation of IκBα was evaluated by a Western blot analysis. (D) RAW264.7 cells were pretreated with 1 μg/ml PAR-1 agonist TFLLRN-NH2 for 30 minutes and then stimulated with 1 μg/ml LPS for the indicated periods. Degradation of IκBα was evaluated by a Western blot analysis. (E) RAW264.7 cells were pretreated with 100 μM AICAR for 30 minutes and then stimulated with 1 μg/ml LPS for the indicated periods. Degradation of IκBα was evaluated by a Western blot analysis. The data represent the mean ± SEM. **, P<0.05. It has been reported that the activation of AMPK through PAR-1 is associated with Ca2+/calmodulin dependent protein kinase kinase (CaMKK) (17). Therefore, we examined whether uPA activated AMPK through Ca2+/CaMKK by using a CaMKK specific inhibitor, STO-609 and a Ca2+ chelator, BAPTA. 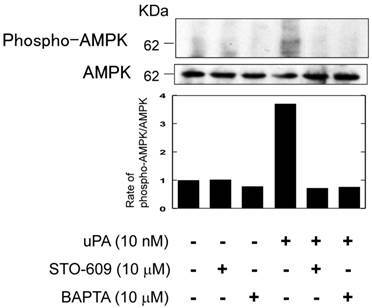 Both STO-609 and BAPTA attenuated the uPA-induced AMPK phosphorylation (Fig. 5). Inflammation can lead to osteoclastogensis by inducing OC differentiation. However, the mechanisms underlying osteoclastogenesis induced by inflammation are not precisely understood. Although it has been reported that the plasminogen activator/plasmin system is not required for OC formation (29), we found that the uPA deficiency promoted inflammatory bone loss induced by LPS, which not only induces inflammation but also osteoclastic bone resorption (6, 8) (Fig. 1A-C). Additionally, uPA deficiency promoted inflammatory osteoclastogenesis in the bone marrow-derived cells induced by LPS (Fig. 1D, and E), and uPA treatment abrogated uPA-deficiency-promoted inflammatory osteoclastogenesis induced by LPS (Fig. 1F, and G). We herein showed for the first time the inhibitory functions of uPA on the LPS-induced inflammatory osteoclastogenesis (Fig. 1). uPA activated AMPK through the Ca2+/CaMKK pathway. RAW264.7 cells were pretreated with a CaKKK specific inhibitor STO-609 (10 μM) or a Ca2+ chelator BAPTA (10 μM) for 30 minutes and then stimulated with 10 nM uPA for 60 minutes. Phosphorylation of AMPK and total amount of AMPK were evaluated by a Western blot analysis. The histogram on the bottom panel shows quantitative representations of phospho-AMPK obtained from densitometry analysis after normalization to the levels of AMPK expression. Next, we showed that LPS induced uPA expression in RAW264.7 cells (Fig. 2A). It has been reported that LPS activates the MEK and JNK pathways, which is associated with the production of TNF-α and IL-6 (30, 31). Therefore, we examined the effect of the MEK and JNK specific inhibitors in the LPS-induced uPA expression, and we showed that the LPS-induced uPA expression is associated with that the MEK and JNK pathways (Fig. 2B). Additionally, we showed the uPA treatment attenuated inflammatory osteoclastogenesis induced by LPS (Fig. S1A-D). These data suggest that the LPS-induced uPA may inhibit inflammatory osteoclastogenesis in a negative feedback loop. It has been known that uPA activates Plg into plasmin, and the uPA-generated plasmin can activate PAR-1, and Plg/plasmin and PAR-1 modulate bone metabolism (19, 32, 33). Moreover, plasmin is essential in preventing periodontitis in mice (34), and may be associated with LPS-induced inflammation. We herein showed that plasmin and PAR-1 activation attenuate inflammatory osteoclastogenesis induced by LPS (Fig. 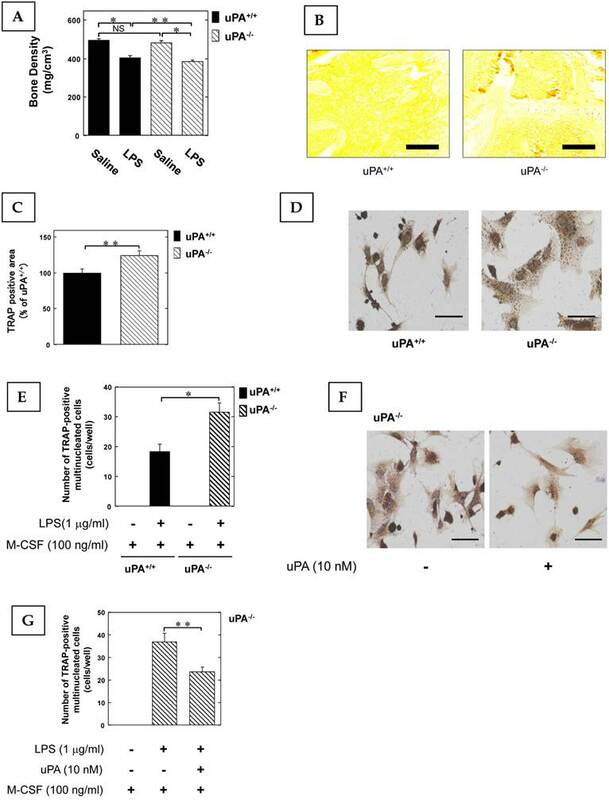 S1E-H, M-P), and the inhibition of plasmin and PAR-1 abrogated the attenuation of LPS-induced osteoclastogenesis by uPA (Fig. S1E-L). We also confirmed that the reduction of uPA and PAR-1 by siRNA promoted inflammatory osoteoclastogenesis induced by LPS (Fig. 3). These data suggest that uPA mediated the prevention of inflammatory osteoclastogenesis induced by LPS through plasmin/PAR-1 activation. Recently, it has been reported that PAR-1 can activate AMPK (35), and the AMPK acts as a negative regulator of osteoclastogenesis (18). Additionally, many studies demonstrated that AMPK can inhibit NF-κB activation, and the inhibition of NF-κB signaling by AMPK is associated with several mediators, such as Sirtuin 1 (SIRT1), peroxisome proliferator- activated receptor gamma coactivator-1α (PGC-1α), p53, and Forkhead box O (FoxO) (18, 27, 28, 36-39). uPA/plasmin/PAR-1 activated AMPK (Fig. S2E, K, L), and attenuated NF-κB activation induced by LPS (Fig. 4). Additionally, the inhibition of AMPK abrogated uPA-attenuated OC differentiation induced by LPS (Fig. S2F-I). Moreover, we confirmed the uPA activates AMPK through the Ca2+/CaMKK pathway (Fig. 5), which is associated with the PAR-1-activated AMPK (17). These data strongly suggest that uPA negatively regulates the development of inflammatory osteoclastogenesis by AMPK activation through plasmin/PAR-1/Ca2+/CaMKK pathway, resulting in the inactivation of NF-κB which is required for the LPS-induced osteocastogenesis. Thus, the LPS-induced inflammatory osteoclastogenesis seems to be regulated by negative feedback loop through uPA/plasmin//PAR-1/Ca2+/CaMKK/AMPK axis. Injection of LPS to human is associated with the activation of fibrinolytic pathway (40, 41), and it has been reported that LPS induces uPA expression in multiple cells, such as human gingival fibroblasts, lung epithelial cells, pre-B lymphoma cells, cardiomyoblast cells (42-45). Additionally, a recent study demonstrated that fibrin accumulation stimulates the inflammatory response through multiple mechanisms (46), and promotes inflammatory osteoporosis (47). Therefore, uPA induced by various organs may be associated with the negative regulation of inflammatory bone loss by promoting of fibrinolysis. We herein propose that uPA has a protective effect on inflammatory osteoclastogenesis, and our findings may provide new insights into the development of clinical therapeutic approach for inflammatory bone diseases. This work was supported by JSPS KAKENHI grants-in-aid for Scientific Research (C: 25460078 to Y. Kanno). YK conceived and designed the experiments. YK, AI, EK, HK, KI, OM were involved in the experiments. YK analyzed the data. YK, AI and OM wrote the manuscript.